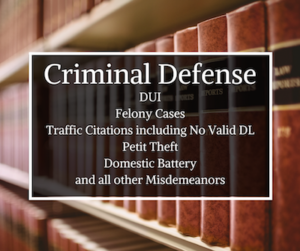 As an Orlando Criminal Defense Attorney, our clients can us to be current on the law and to have the in-depth knowledge and familiarity with courts throughout Central Florida. We focus on both state and federal criminal charges. Regardless of what you have been charged with, we will examine the details of your case to provide you with a solid defense. Why Our Orlando Criminal Defense Attorney? At the Law Office of Frederic E. Waczewski, P.A. we care what happens to you, and we are dedicated to investigating your case, negotiating assertively, and fighting in court as necessary to defend your rights. If you or a loved one has been charged with a crime such as DUI (drunk driving), a drug offense or assault, this is a critical time with futures hanging in the balance. For caring, legal representation you can trust, contact our Orlando Criminal Defense Attorney to schedule your free consultation where you can discuss your specific situation. Drug offenses, including felony charges for sale, distribution, manufacture, or trafficking in controlled substances such as marijuana, cocaine, heroin, methamphetamine and prescription medication. Don’t wait any longer. Seek advice from a knowledgeable and experienced attorney and obtain justice. Contact us now.